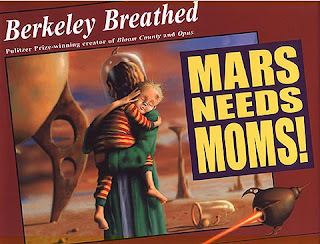 MARS NEEDS MOMS! 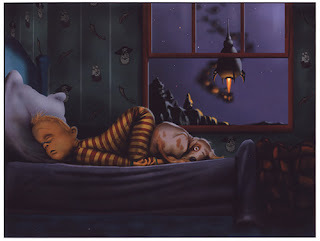 is a picture book that kids and their parents can enjoy. I’m always looking for “science fiction” for very young people, and this fit the bill. It’s done by Berkeley Breathed, with brilliant illustrations and fun humor. I took it to school last week and read it to my second graders, and they enjoyed the humor, loved the illustrations, but were very serious and concerned with what happened to the mom on Mars toward the end of the story. They were greatly relieved when we got to the ending, and things turned out okay. Milo doesn’t get it: What’s the big deal about moms? They’re just slavedriving broccoli bullies. Yet they are worshipped the world over! Perhaps even the galaxy over–because here come Martians and they’re after one thing only: moms. Milo’s mom in particular. Who better to drive them to soccer practice and to pizza parties? That’s quite a long way to come for a mom–could it be that Milo has been overlooking something special? From Pulitzer Prize winning comic strip creator of Bloom County and bestselling author Berkeley Breathed comes a funny, poignant book about how the unique love that binds our families can be overlooked in the rush and tumble of everyday lives … especially those of disgruntled little boys. This was a fun book to read for Carl V’s SCI FI EXPERIENCE. 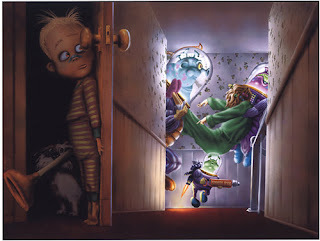 This entry was posted in Challenges, Children's books, Science fiction on January 25, 2009 by Robin. The illustrations in this book look incredible. What a great little book! Hi Robin, apparently my daughter was the last to sign in to google on my computer so my last comment–above–has her name and picture –but really it is from me! That sounds so cute that I went off to look for a copy and I couldn’t find it! Is it an advanced reader? Nymeth, it is fun, and my kids loved the artwork. I couldn’t resist counting it for Carl’s Sci Fi Experience. Kim, it’s a fun little book. Bookfool, it’s not an advanced reader copy. I picked it up at our library after seeing it on a science fiction list. I think it was published in 2007. Oh, I need this one for Tomas! What a hit.